Sigh. I didn’t love this book. I kind of figured going into it that it wasn’t going to be my cup of tea because it’s steeped in fantasy and magic, and I’m more of a real world girl (the main reason I’ve never read the Harry Potter series – gasp!). But I read it because it’s my book club’s current pick and I feel a certain obligation to try to read most of the books chosen by my book club. Set in the late 1800s-early 1900s, at the heart of the story are Celia Bowen and Marco Alisdair, bound together as children but not destined to meet until years later. What they are bound by is a competition of sorts arranged by Celia’s father, Prospero the Enchanter, a famous magician of his time, and Alexander, a mysterious man who plucks Marco out of an orphanage for the sole purpose of grooming him for this competition. So the two children spend their childhoods training for the competition that is to begin in their adulthood – a competition that is never completely understood by either of them. The competition aspect of it was difficult for me to understand, which is a big reason I had trouble with the story. It has to do with each of their skills as illusionists, and also endurance, and in the end, the winner is the one left standing – or more to the point, the one who doesn’t die. But alas, Celia and Marco meet face to face and fall in love (of course), and eventually they figure out that the only way the competition can ever end is for one of them to die, and since they’re in love, of course they can’t bear for the other to die . . . you get the picture. The venue for the competition is a magical and mysterious traveling circus that appears unannounced in different cities all over the globe. 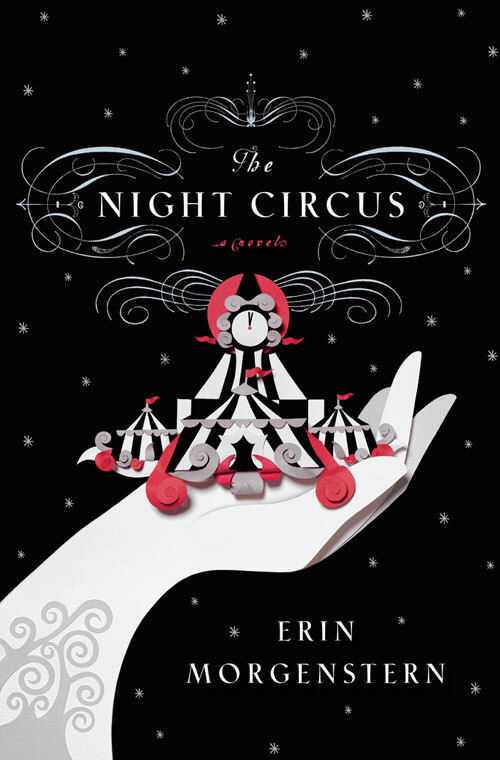 The circus is filled with interesting characters, including a tattooed and wise contortionist, and a pair of clairvoyant twins. There are a lot of characters with strange names to keep track of, and honestly, I could never figure out what/who was supposed to be real, and who/what was supposed to be only illusion. I suspect the author intended for the line between supposed fantasy and supposed reality to be blurred for the reader. I didn’t hate the book, but it took some work to get through it. But I got through it.